With iTestMic, microphone sensitivity will be automatically loaded from calibration information stored in the iTestMic’s internal memory. This calibration information may have been set at the factory, or it may have been set from within an app, such as SoundMeter. In SoundMeter, it is possible to perform a sensitivity calibration without overwriting the calibration values stored in the iTestMic. SoundMeter can also store that information in the iTestMic for calibrated measurements in other apps that support the iTestMic. 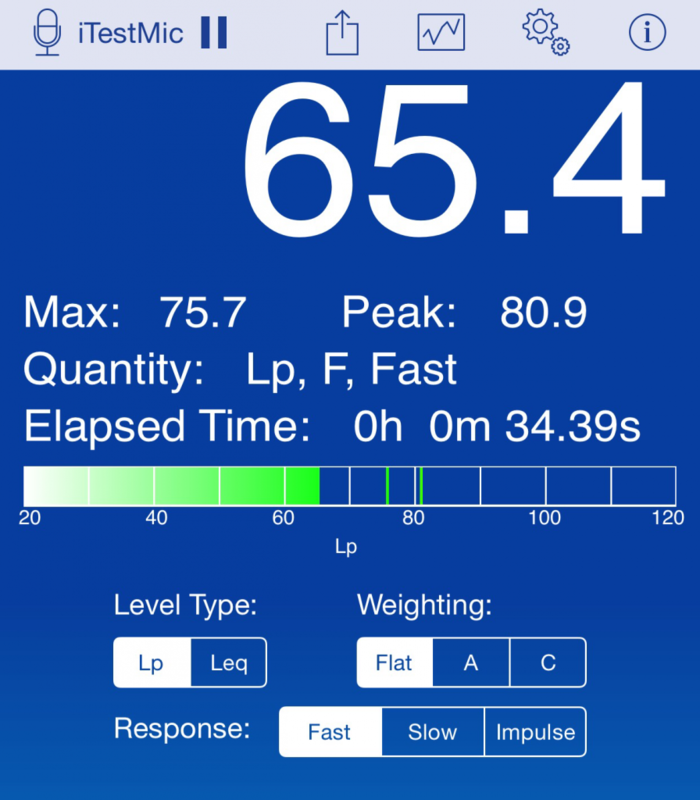 SoundMeter also supports selecting iTestMic’s high and low input ranges. Note: There is currently a bug that sometimes invalidates the calibration information stored within the iTestMic for the High mic input range. This bug affects use of the iTestMic with Studio Six Digital’s own apps, as well. With iAudioInterface2, SoundMeter can select between mic and line input types, mic and line input gain ranges, and manual volume control options. The volume control knob of the iAudioInterface2 can be assigned to the input gain or the output gain, or it can be disabled entirely to avoid accidentally invalidating the current sensitivity calibration. 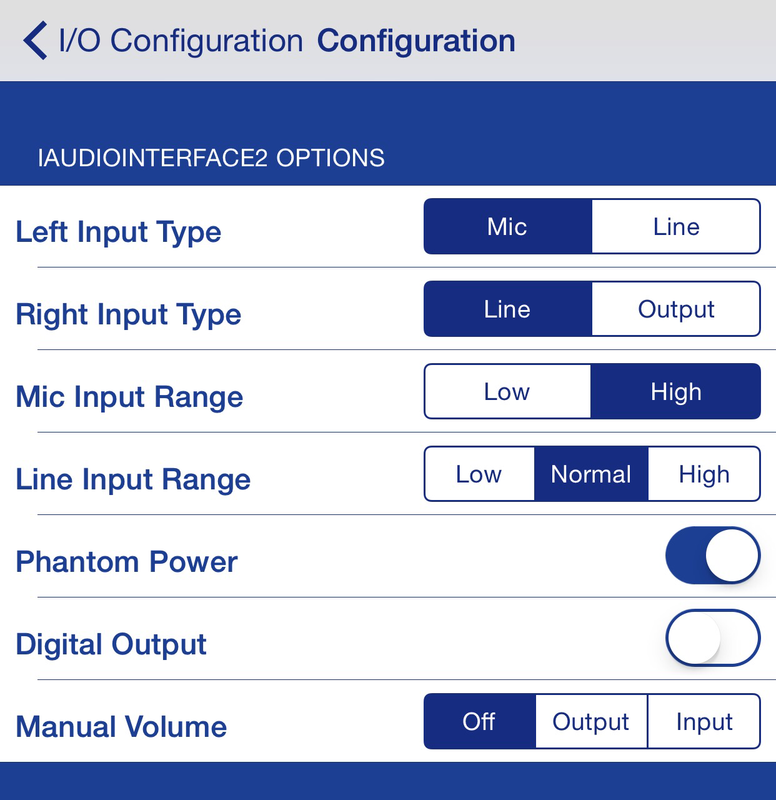 Also from within the app, Phantom power and digital audio output may each be enabled or disabled. SoundMeter remembers each of these settings for the next time you connect iAudioInterface2 or relaunch the app. Note: The Dayton UMM-6 must be connected to your iOS device via Apple’s USB camera adapter (either for Lightning or 30-pin dock connector, depending on your device). Sometimes the UMM-6 shows up in iOS as USB PnP Sound Device. If that happens, unplugging the UMM-6 and plugging it back in will generally solve the problem (it may take 2 or 3 tries). When properly connected, “UMM-6” will appear as the input device name in SoundMeter’s toolbar (at the top of the screen).